Westfriesland makes considerable efforts to welcome tourists and other visitors with its many attractions. Its appealing rural scenery and many amenities are perfect for a pleasant holiday, both for those who prefer peace and quiet and for those looking for an active vacation. The region is ideally suited to exploration by bicycle or car, but also those who like walking or boating through the rolling farmland will enjoy its windmills and typical“stolpboerderij (Haubarg)” farmhouses. 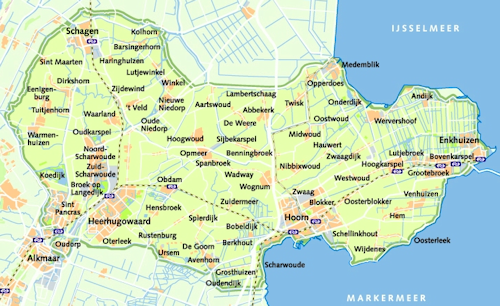 Westfriesland is dotted with picturesque villages, pretty towns, leisure facilities and nature reserves, as well as many museums and tourist attractions. In the summer months many of its localities organize touristic markets or folkloric festivities.